Tun Tavern, "birth place" of the Marine Corps. 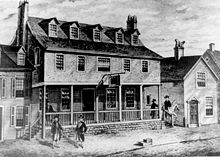 Tun Tavern, in Philadelphia, Pennsylvania, is regarded as the birthplace of the Corps as the location of the first Marines to enlist under Commandant Samuel Nicholas, though it is disputed if a recruiting drive may have occurred earlier at Nicholas's family tavern, the Conestoga Waggon [sic]. When the Revolutionary War ended in 1783, the Continental Navy was disestablished, and with it, the Continental Marines. The Corps was re-established on 11 July 1798, when the act for establishing and organizing a Marine Corps was signed by President John Adams. John A. Lejeune, author of Marine Corps Order 47. Col Lewis B. "Chesty" Puller cuts the Marine Corps birthday cake in 1950, during a brief reprieve in battle during the Korean War. In a more somber tradition, Samuel Nicholas's grave in the Arch Street Friends Meeting graveyard in Philadelphia is marked with a wreath at dawn by a group of Marines annually on 10 November to celebrate his role in the founding of the Corps. Franklin A. Hart cuts a cake for The Basic School while David M. Shoup looks on in 1951. Note that this cake has candles. Marine Corps Birthday 1969, Marine Corps Development and Educational Center Quantico, Commanding general Lewis J. Fields cutting the cake and Commandant of the Marine Corps, Wallace M. Greene (on the left) looks on. James T. Conway leads a unit run of Marines in 2009. Austin R. Brunelli cutting the cake with the members of the 24th Marine Regiment during the celebration of the Marine Corps Birthday in Maui, 1944. Merwin H. Silverthorn cuts the Marine Corps Birthday Cake in 1953 at MCRD Parris Island. ^ Continental Congress (10 November 1775). "Resolution Establishing the Continental Marines". Journal of the Continental Congress. United States Marine Corps History Division. Archived from the original on 7 October 2010. Retrieved 2 February 2010. ^ "Tun Tavern History". tuntavern.com. Retrieved 14 April 2007. ^ Simmons, Edwin Howard (2003). The United States Marines: A History, 4th Edition. Annapolis, Maryland: Naval Institute Press. ISBN 1-59114-790-5. ^ Chenoweth, Col H. Avery; Nihart, Col Brooke (2005). Semper Fi: The Definitive Illustrated History of the U.S. Marines. New York: Main Street. ISBN 1-4027-3099-3. ^ Hoffman, Jon T. (2002). USMC: A Complete History. New York City, New York: Universe Publishing. ^ United States Congress (11 July 1798). "An Act for Establishing and Organizing a Marine Corps". Marine Corps Historical Division. Archived from the original on 7 October 2010. Retrieved 7 October 2010. ^ "History, Traditions behind the Marine Corps Ball" (PDF). The Windsock. MCAS Cherry Point, United States Marine Corps. 66 (45): A3. 6 November 2008. Retrieved 8 November 2008. ^ a b Lejeune, Major General John Archer (1 November 1921). "Marine Corps Order No. 47 (Series 1921)". Mainr Corps History Division. Archived from the original on 6 October 2010. Retrieved 2 February 2010. ^ "Marine Corps Birthday Celebration". Customs and Traditions. Reference Branch, History Division, United States Marine Corps. Archived from the original on 19 February 2007. Retrieved 11 October 2008. ^ "Commandant's Marine Corps Birthday Ball, 2008". Archived from the original on 4 November 2006. Retrieved 8 November 2008. ^ Sturkey, Marion F. (2001). "Marine Corps Birthday". Warrior Culture of the U.S. Marines. Heritage Press International. ^ "Marine Corps Birthday Celebration". United States Marine Corps History Division. Archived from the original on 13 November 2010. Retrieved 11 June 2010. ^ LaVine, Cpl Nicole A. (5 November 2008). "Combat Center honors past warriors, battles in pageant". The Observation Post. United States Marine Corps. Archived from the original on 12 November 2008. Retrieved 9 November 2008. ^ Harris, Lance Cpl. Benjamin (12 November 2009). "Marines double-time for birthday bash, celebrate 234 years". Headquarters Marine Corps. Arlington, Virginia: United States Marine Corps. Archived from the original on 15 November 2009. Retrieved 14 November 2009. ^ "The 229th Anniversary of the U.S. Marine Corps in Iraq". U.S. Department of Defense. November 2004. Retrieved 8 November 2008. ^ Mucha, Peter (11 November 2008). "Ceremony honors Marine Corps founder". Philadelphia Inquirer. Sturkey, Marion F. (2001). Warrior Culture of the U.S. Marines. Heritage Press International. ISBN 0-9650814-1-9. Wikimedia Commons has media related to Birthday ceremonies of the United States Marine Corps. Cushman, Sgt. Steve (17 November 2008). "'Two battalions of Marines' celebrate Corps' 233rd birthday in Afghanistan". 2nd Battalion 7th Marines. United States Marine Corps. Archived from the original on 2 April 2015. Retrieved 26 November 2008. Fuentes, Gidget (November 2009). "Happy Birthday Marine Corps". Marine Corps Times. Gannett Company. Retrieved 14 November 2009. This page was last edited on 4 December 2018, at 13:35 (UTC).